National Cancer Institute Director, Norman “Ned” Sharpless, MD, visited the Robert H. Lurie Comprehensive Cancer Center of Northwestern University on October 2, one year after becoming the 15th director of the nation’s principal agency for cancer research and training, and the world’s largest funder of cancer research. At a presentation for the cancer center’s faculty, students and staff, Sharpless discussed his research on “The Dynamic Interplay Between Cancer and Aging,” answered questions, and talked about his vision for the NCI. A distinguished leader and innovator, Sharpless is widely recognized for his important contributions to the understanding of the relationship between aging and cancer, and in the preclinical development of novel therapeutics for melanoma, lung cancer, and breast cancer. 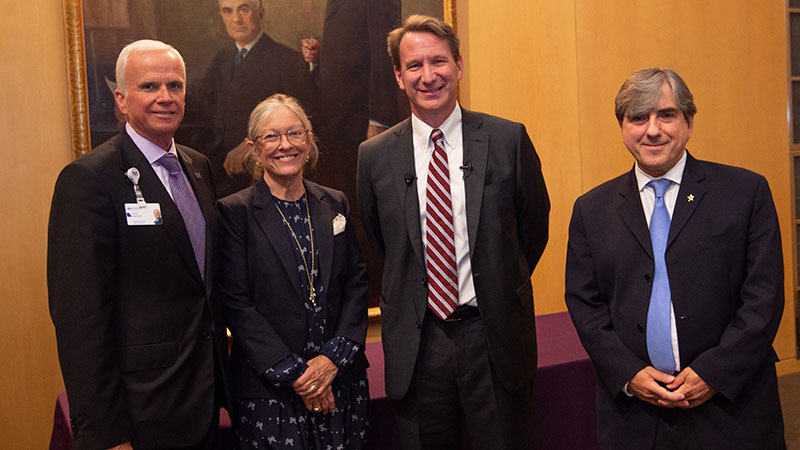 Before and after his presentation, Sharpless met with leadership, faculty and students from across the Lurie Cancer Center and Northwestern Medicine. The Lurie Cancer Center, one of only 49 NCI-designated Comprehensive Cancer Centers, recently received the highest rating possible from the NCI, an overall “exceptional,” on the competitive renewal of its Cancer Center Support Grant. In addition to receiving the highest rating in its history for the excellence of its research programs and patient care, Lurie Cancer Center received a near-perfect impact score of 12. Numerical scores are assigned on a scale from 10 to 90, with 10 being a perfect score.